Chances are you’d love to have more office space, right? Unfortunately, that’s often not feasible for a variety of financial or practical reasons. Usually, you have to make do with what you have. Fortunately, when you’re working with limited office space, there are ways you can optimize the design to make better use of the room you have. 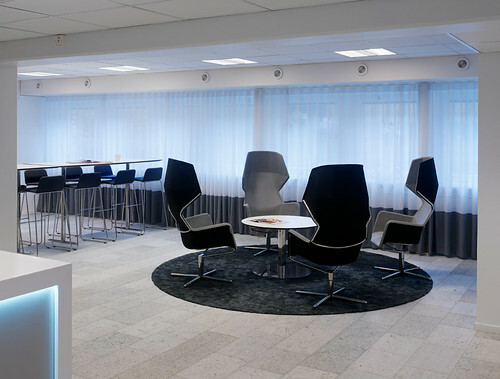 What makes an office appealing? Is it the furniture, the design, the colors, the ambiance? Unfortunately, working in a tiny space and devoting 8 hours a day to a desk you don’t even like should compel you to make a change. Here are some design tips to make your office space seem bigger and more usable. Using a clean design that leaves your workspace uncluttered can go a long way to making the space feel bigger. Built-in design elements can reduce unusable space, and sticking to a consistent color scheme minimizes a cluttered feel. Having clean, simple styles and well matched pieces makes an office space harmonious, and makes you feel more organized, too. In the interior design business less is more. Do you actually need a desk with lots of drawers? No, you don’t. The minimalist type of office desk screams simplicity. Your paperwork should be deposited in a separate cabinet that looks chic and organized. That cabinet can be a modular furniture piece that is also a coffee table for example. The key to a clean office is to make the most with the space you have available, and not add as many furniture items as you can. When you’ve got a small office space, breaking it up with cubicle walls will make things feel even more cramped. See if you can get rid of some cubicle partitions to open up the space. This could make the work day more cheerful for everyone. An effective office design is all about convenience. Believe it or not, we live in a modern world where people actually like to work together. Nobody wants to stay isolated in their cubicle and count their minutes until the lunch break. Walls are bad for business, figuratively speaking. So why not take them down and support group cooperation to boost productivity and help your staff work with determination. Dark colors may feel warm and cozy, but they really make a space feel smaller and more closed in. When you’re working with modest office space available, try using lighter, natural colors. This will seem to expand the room and make it feel lighter and airier. You can also use strategically placed mirrors to give the illusion of more space. 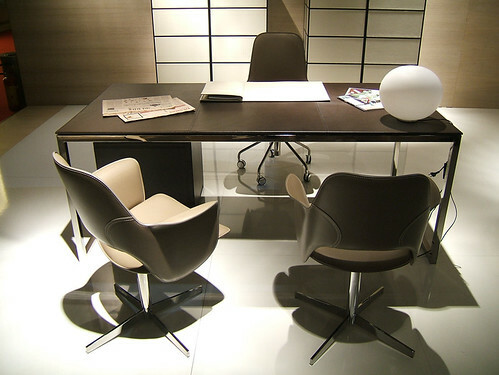 Some office furniture is specially designed to maximize utility in a small space. For instance, a desk with integrated file drawers can eliminate the need for a separate filing cabinet. Furniture that is built-in may save space, too. A side benefit of these design elements is that it puts everything within easy reach, so you don’t need to walk across the room to get your files. Multi-purpose furniture is excellent when you want to save space and keep things organized at the office. Where you do have walls in the office, you might as well put them to good use. Putting shelves up on a wall can eliminate the need for a separate bookcase. Adding whiteboards can make the area more productive for collaboration. Make your wall spaces serve a purpose, instead of being purely decorative. Just be sure not to go too far – a wall completely full of books can overwhelm a small space. Studies have shown that nothing compares to getting natural light when it comes to improving one’s mood. If your workspace has only artificial light, see how you can open it up to get some daylight in, and you’ll find that people’s productivity goes up. When you do need artificial light, make sure it’s focused correctly on the tasks to be done, and avoid using precious floor space for lamps. Having to plug in for internet is so old fashioned. The world today is going wireless, so make sure your office is, too. Employees now have laptops, tablets, and other assorted gadgets. To make the most of collaborative opportunities, make sure everyone has fast Wi-Fi access throughout the office. Nothing numbs the soul like spending day after day in a monotonous, drab environment, without a whit of life or character. Make sure everyone has a chance to express their individuality with some personal touches to their workspace. You can share some well-chosen pieces of art or inspirational quotations, and let everyone else do something to make their work area their own. An effective office design is an efficient office design; or at least that’s what major corporations think. CEOs and business owners have finally come to the same conclusion – modular furniture is practical, chic, and creative. It boosts creativity, it makes people collaborate, and socialize. The current work environment is all about cooperation, so increasingly more companies are supporting the idea of a collaborative work space. Choose to make a difference if you want your people to work from 9 to 5 with a smile on their faces. It’s not something impossible to achieve as long as you’re willing to give them a reason to work at their fullest potential. Is an Open Floor Plan a Good Idea?